Whether it is an award ceremony, group incentive travel, conference or gala dinner, Penguins understand that every corporate event is created to meet a business need. Increasing profits, managing change, employee retention are just a few of the reasons companies organise corporate events. Penguins have been working successfully for over 30 years, creating events and experiences that deliver against corporate objectives in a measurable way. A sales kick-off for 500 employees, a user conference for 1,000 customers or a sales incentive for 35. Whoever the audience, whatever the event, the key is to make sure the attendees are engaged. And it's not just at the event, pre & post comms are equally as important, extending the lifetime and impact of your event. 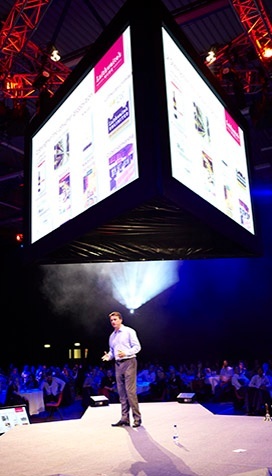 It's our aim to get to know your audience, working with you to identify opportunities to drive key messages in a way that make your audience feel a part of the event rather than just another attendee. Planning an event can be a daunting task. Penguins aim to be your event support no matter which stage of the planning process you are at – established for 30 years we have the experience and contacts to solve alomost any situation. Our aim is always to get right under the skin of your organisation and your audience, so we fully understand the business. Penguins can step in and ease your workload. We will produce a seamless event, making you look great.